We thought about setting sail for Cozumel yesterday, but once we set out the current was so strong against us and wind was directly on our nose, making us move at a snails pace of 3 knots. It would have taken 11 hours to get there, so instead we sailed for a while then anchored in the Playa de Carmen area. The water we sailed through was an amazing shade of turquoise. While sailing all the creatures gathered on the sugar scoop and looked out over the water. What a fun group of kids! We thoroughly enjoyed relaxing, swimming and paddle boarding, and close to sunset, set sail back to Isla Mujeres. Sunsets never grow old on the ocean. Another wonderful day in our home on the sea came to an end, and we are so grateful to have spent it with our amazing friends, the Nell Family. We are so blessed. Last night our awesome friends, the Nell Family, arrived. They flew to Cancun and caught the ferry across, and Danny and I took the dinghy over to the ferry dock to pick them up. Our ride back was a wet one! We had 7 people in the dinghy, plus all their luggage, and with the added weight we were taking on all sorts of drenching sprays over the bow as we motored. By the time we reached the marina we were all soaked. It is so wonderful to have them here on Tanda Malaika with us. Aidan and Glade slept out on the trampoline and didn’t wake till 9am – long after the sun had risen. This morning when we awoke we gathered around, ate breakfast and played in the water for a while. We dropped everyone off for a snorkel at a reef where they drifted down in the current, and picked them up farther down afterward. The current is so strong here, and makes being in the water a major workout. After returning to the boat we grazed on watermelon for a while then decided to walk/cycle into town for ice cream. It’s always an adventure with a crowd like ours. Ethan, Aidan and Glade were ninjas on the skateboard and Penny board. We walked across to the other side of the island and some of the creatures jumped in for a while, but we had everyone come out when we saw that there was an intense long shore current and riptide. The scene before us was exquisite, saturated with intense varying shades of blue edged with crisp white breakers. “Hi! I hope you made it safe to Roatan. I found you drifting letter that you posted on the glass bottle and I just wanted to say hi. I found it in San Pedro Ambergris Caye Belize. I was raking the beach front of a resort by name EL PESCADOR. We will write back and share our adventures with him. This evening we are all back safe and sound on Tanda Malaika, and are so grateful to be able to share a part of our lives with our friends, and to see the joy and peace it brings them too. El Milagro Marina has quite the charm. It is smaller than other marinas we’ve been in, but has a big friendly spirit. There is only room for about a dozen sailboats, one of which is a spot wide enough for a catamaran, and unlike many marinas, there’s only one cat spot. Just off the dock there is a large open area with tables and chairs, where marina folk can gather. A large kitchen with an awesome oven is available to us as well. There is an area with a ping pong table and darts, and a ‘movie theater’ where we can take our DVD’s to watch shows altogether, and hammocks hang from many trees. A small beach area and a swimming pool are also here to enjoy. The locals are so friendly and are a very happy people. I spoke with some of them last night, and on Tuesday morning I’m joining them for a trip to the grocery store to buy supplies for them to teach me how to make legit beans, rice, salsa and tacos on Tuesday night. In exchange I will teach them how to bake bread. Today we met a family who are new to the area and are in great need. They go hungry much of the time. We will be making a trip to the grocery store to buy them groceries. We are so grateful to be here, to see the surrounding beauty, enjoy the people and their traditions, learn from them, and help them in any way we can. Tonight, our friends, the Nell family, will be joining us from St George, Utah, until the 6th, and we are excited to share this with them too. On Christmas Eve, the 12 of us set out on foot to find an ice cream shop. Since I’d been here before, I knew there was Nutella flavored ice cream somewhere on this island, and we were going to find it! We walked for about 15-20 minutes into town, while Danny rode a bicycle due to a sore foot, and there, next to the town square, we found the treasure. Out on the streets, people were excitedly shopping for their final gifts, the smell of food filled the air from taco stands and children laughed as they ran in between their parents legs while they gathered in groups to converse. A large Christmas tree stood tall in the square, with a beautiful Nativity to its side. These were happy sounds in beautiful surroundings. As a family we decided that this would be a different Christmas than those we’d had in the past. Rather than focusing on physical gifts, we wanted to set aside gift exchange between us, and in its place, find humanitarian work to do, and focus on gifts of love for others. Online I found an orphanage close by, where we will go and help in any way we can. They have 35-40 children there, including some with special needs. On Christmas morning I cooked everyone pancakes and bacon and prepared some fresh paw paw, and everyone loved it. Danny was especially excited for the bacon. After eating we took the creatures out and played in the water for a while. The current is so strong here, and at one point Danny had to go on a ‘rescue mission’ in the dinghy to tow a bunch of kids back to the marina. I made a big potato salad and Emma baked a cake for the marina Christmas pot luck. Shad and Denise and their creatures joined us as we had quite the feast along with about 50 other people. Everyone mingled and enjoyed each others company, and finally with full bellies we lay on the trampoline and talked till after sunset. The clouds were so beautiful. A thick, bright golden glow shone from them as they spread out above the starboard side of Tanda Malaika. The creatures trickled in after a while, hinting about more ice cream, so we all made our way into town once again for round two. Time came for goodbyes, and each of us gave Skyler an extra long hug. I whispered to her how much I love her through teary eyes, as did Jude, Emma and Mycah, and we walked back to our home talking about how much we miss her already. I loved spending that time with my sweet sister, Denise, and her awesome husband, Shad. We hope they will return to us soon so that we can sail the Eastern Caribbean together. We wanted to set sail as early as possible, but waited patiently for the package to arrive. Tanda Malaika was prepped and ready for the journey, so we took advantage of the time and played for a bit. The creatures broke out the paddle boards and Danny and I towed them around behind the dinghy. While out playing we were called on the radio and told that the package was in Roatan, but was on the other side of the Island and would only be delivered to us next week. So, we set sail. From the moment we raised the sails to the time we pulled in to port, we had fantastic winds. It became obvious shortly after setting out that the winds were strong enough that we needed to reef the main, and after a while we reefed the jib as well. 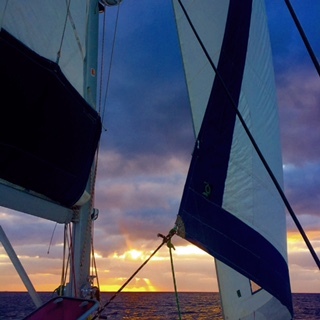 With two reefs in each sail, we averaged 9 to 10 knots, sometimes reaching up to almost 15 knots. Winds were 20 to 30 knots and the seas were rough. Huge swells came from the East as we sailed North, putting us on a beam reach, and Tanda Malaika took it all in stride as she rose and fell over swells and billowed beautifully in her sails. Ocean spray would reach 10 ft high as it swept up over the bow and periodically those on watch at the helm would be sprayed as water fanned out over the starboard hull. It was exhilarating! The power of the wind and ocean is something to be respected, and is so amazing to experience as we use it to drive us around the world. A sea bird found refuge on Tanda Malaika, tucking its head into the warmth beneath it’s wing, and only left us as we passed Cancun. What should have taken us 2 1/2 days, took us 1 1/2, and at about 2am yesterday morning we pulled in to El Milagro Marina in Isla Mujeres and dropped anchor. Both vessel and crew were covered with salt, and after quick showers we snuggled down in our berths and rested soundly till morning. Skyler’s family were already in Isla Mujeres waiting for her, but she didn’t know it, and when Danny and I set out in the dinghy to check in at the dock, they were there excitedly waiting. They piled into the dinghy with us and Skyler was quite surprised to see them as we pulled up to the stern. The slip that we were assigned, is probably about 27ft wide, and Tanda Malaika is 25ft wide. Water is extremely shallow, barely deep enough for our 4 1/2 draft, and the wind was blowing pretty hard, so Danny had to use his amazing ninja Captain skills to back us in to the dock. It’s time to get settled in and explore our surroundings, and to find out more about the humanitarian work opportunities around us. We are still in Roatan. Danny checked his tracking number on an important package yesterday morning and realized it had finally arrived in Honduras and would be delivered today. He figured it’d be worth waiting here another day just in case by some miracle it does in fact arrive. He and I took a taxi in to Coxen Hole yesterday morning to check out, and while en route my sister sent me photos of Daddy and Jan’s graves. The family had met out at the cemetery to place miniature Harley’s where they lie. Snow covers the ground adding a miserable aching cold to the scene. Jan’s headstone is still being worked on, and will most likely be set in place after the snow melts in the Spring. I began my usual free flowing of tears as I thought about them. That overwhelming aching that time cannot heal. I tried to collect myself as we arrived at the immigration office, and as I made my way across the concrete, I looked out over the ocean, and anchored in the bay was a huge orange ship, named Jan. Though Jan has always liked the color combination of red, black and white, orange has been his favorite for some time. (It is the Harley color, of course.) I was filled with overflowing emotion, and somehow among the sadness, found peace in the scene as well. Late afternoon, I talked Danny into walking down to the beach with me, where we pulled loungers out into the water and relaxed for a while. The monkeys were causing havoc with the tourists, as they stole sunscreen and cameras, and after some time when the bugs arrived in larger swarms, we made our way through the palms back to the boat. On the way, we met a woman named Alison Wright. She walked with us to Tanda Malaika as she told us that she was a writer and photographer, and was here on Fantasy Island photographing it. She has published several books and has been featured in galleries and magazines like National Geographic. She sat with us in our home for quite some time, sharing her adventures, and when Danny told her he has a drone, they decided to meet this morning so that she can fly it and photograph with him. Danny has been chomping at the bit since 6:30am, excitedly waiting for her, which has been quite something to witness…it takes a pretty special person to get him up at that hour. So, today is the day (once again), that we leave Fantasy Island. This time it will be for sure, because in order to be docked in Isla Mujeres by Christmas, we can leave no later than today. As I have been writing, Cheeky has been sitting on my shoulder – completely mesmerized by my computer while playing with my hair. I’m going to miss his sweet little face.